Are you now or have you ever been… The first official poster has debuted for Jay Roach's biopic Trumbo, starring Bryan Cranston as Hollywood screenwriter Dalton Trumbo, who defied the House Un-American Activities Committee by refusing to testify regarding accusations of ties to communism. We featured a first look photo from this late last year, and this poster is much of the same, showing Cranston with a cigarette at his typewriter and those signature glasses. With a release set for November this fall, we expect the trailer to arrive soon. Co-starring Elle Fanning, Diane Lane, Helen Mirren, Alan Tudyk, John Goodman & Louis C.K. 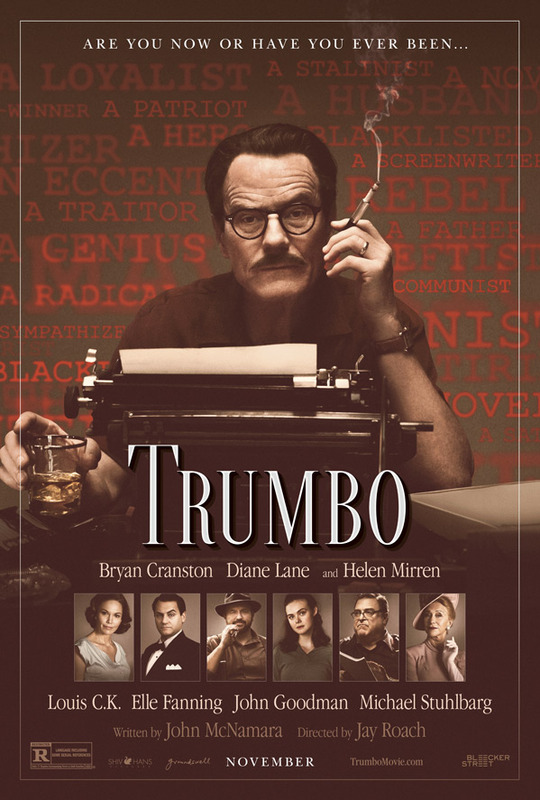 Trumbo is directed by Jay Roach and written by television writer John McNamara. The film tells the story of real-life screenwriter Dalton Trumbo, the scribe of classics like Spartacus and Roman Holiday, who was blacklisted and sent to prison during the Red Scare when the House UnAmerican Activities Committee (HUAC) was questioning Hollywood talents about Communist ties, forcing many to have pseudonyms and struggle to survive in the face of baseless accusations. Actors John Goodman, Helen Mirren, Louis CK, Elle Fanning, Michael Stuhlbarg and more star. It will be released sometime in 2015 from Bleecker Street Films. Trumbo will premiere at the Toronto Film Festival this September before opening in theaters in November. This is a drama? From Roach? The cast is stellar, so maybe that will make this good. But Roach is a little past his prime for me to be super confident in this film.